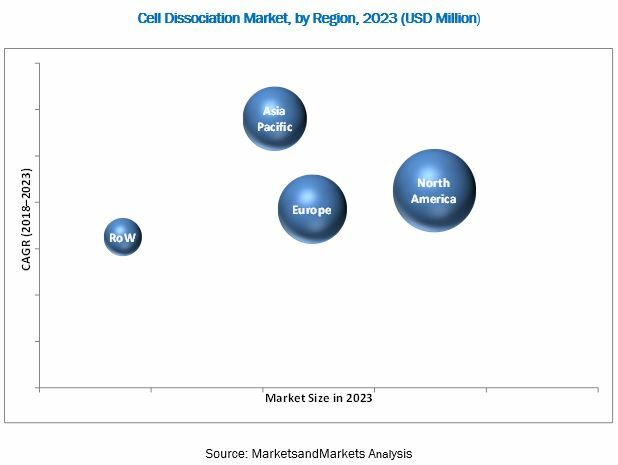 [114 Pages Report] The cell dissociation market is expected to reach USD 440.5 Million by 2023 from USD 214.1 Million in 2017, at a CAGR of 12.8%. The base year for this study is 2017 and the forecast period is 2018–2023. Top-down and bottom-up approaches were used to estimate and validate the size of the market and the size of various other dependent submarkets. The overall market size was used in the top-down approach to estimate the sizes of other individual submarkets (mentioned in the market segmentation—by type and region) through percentage splits from secondary and primary research. The bottom-up approach was also implemented (wherever applicable) for data extracted from secondary research to validate the market segment revenues obtained. 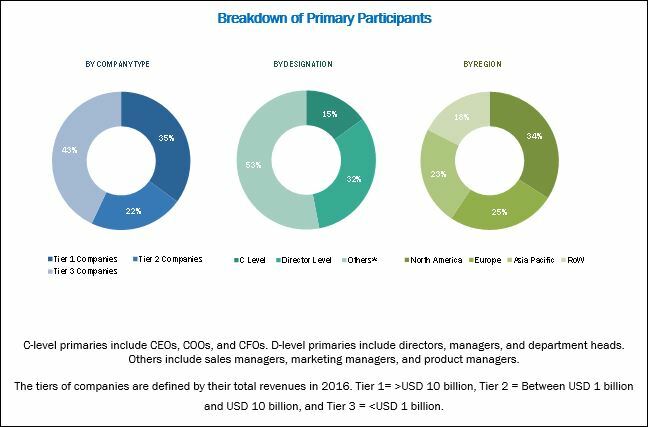 The major players in the cell dissociation market include Thermo Fisher Scientific (US), Merck KGaA (Germany), Roche (Switzerland), Miltenyi Biotec (Germany), HiMedia Laboratories (India), STEMCELL Technologies (Canada), BD (US), ATCC (US), PAN-Biotech (Germany), and GE Healthcare (US). The global cell dissociation market is expected to reach USD 440.5 Million by 2023 from USD 241.2 Million in 2018, at a CAGR of 12.8%. Market growth is primarily driven by the rising R&D investments in the life sciences industry, increasing research on chronic diseases and rising government funding for cancer research. The global market is segmented by product, tissue, type, end user, and region. By product, the market segmented into enzymatic dissociation products, non-enzymatic dissociation products and instruments & accessories. The enzymatic dissociation products segment estimated to account for the largest market of the global cell dissociation market in 2018. The end user segment includes pharmaceutical & biotechnology companies, research & academic institutes, and other end users. The pharmaceutical & biotechnology companies segment is estimated to register the highest growth rate and largest market share during the forecast period. This is primarily attributed to increasing demand for enzymatic dissociation products and instruments by these end users. The tissue segment includes connective tissue, epithelial tissue, and other tissue. Among all, the connective tissue accounted for the largest share of the market in 2017. This is primarily attributed to the increasing research on cancer. The global cell dissociation market is dominated by North America, followed by Europe. North America will continue to dominate the global market in the forecast period, however, Asia Pacific is expected to witness the highest CAGR, with the growth in this market centered on Japan, China, and India. Factors such as the increasing R&D investments and government funding for chronic disease research are driving the market in the region. Thermo Fisher Scientific (US), Merck KGaA (Germany), Roche (Switzerland), Miltenyi Biotec (Germany), HiMedia Laboratories (India), STEMCELL Technologies (Canada), BD (US), ATCC (US), PAN-Biotech (Germany), and GE Healthcare (US) have been identified as the key players in this market. These companies have broad product portfolios with comprehensive features. These leaders also have products for all end users in this market, a strong geographical presence, and a focus on continuous product innovation. Key industry players are focusing on the expansions of their presence to maintain and enhance their position in the cell dissociation market. 12.3 F. Hoffmann-La Roche Ltd.